Last week was a big week of “4s” on our boat. I turned the big 4-0 and Maria turned 4. I’m not a big gift person but I was hoping for one thing on my birthday…for my parents to be with me. 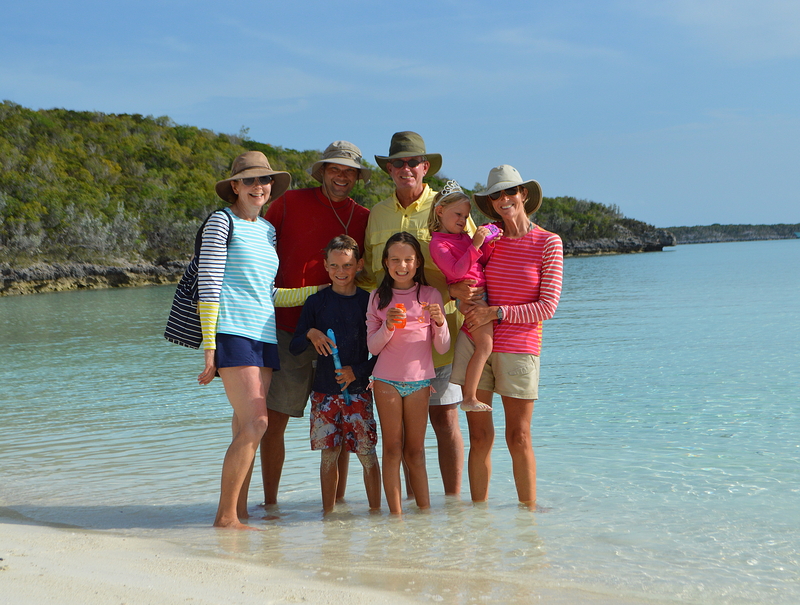 A year ago I started planting the seed with them that they should come visit us in the Exumas for my 40th. I really wanted them to experience for a week what we’ve been experiencing these last two years. I wanted them to witness just how much the kids thrive on the ocean in nature. I was thrilled when they said it sounded like a grand idea. But when they were in Costa Rica in December visiting us, my parents sat me down and said they had decided to not come visit us in the Bahamas. I…just…sat…there. I couldn’t say anything. Then the tears came. Not like the tears I shed my senior year in high school when I played all pathetic and duped them into letting me go on a senior trip to Myrtle Beach. These were real tears filled with genuine sadness. Well, as you can see from the photo here, I still got it! The tears worked and my parents came for a visit! It was not easy getting to us, so my parents get extra, extra brownie points for visiting. First my parents had to drive three hours to Cleveland, then they took a plane to the big Fort Lauderdale airport, then they took a taxi to the small Fort Lauderdale airport. Next they boarded a very tiny plane (have I mentioned my mom is claustrophobic?) and flew first to Andros Island for immigration, got back on the plane and flew to Black Point settlement in the Exumas. They were supposed to fly into Staniel Cay but the airport there shut down a few days before my parents arrival because of pot holes! Filling in the pot holes and repaving that runway should take about 5 days but it’s estimated to take 6 months. Hey, this is the Bahamas Mon’! 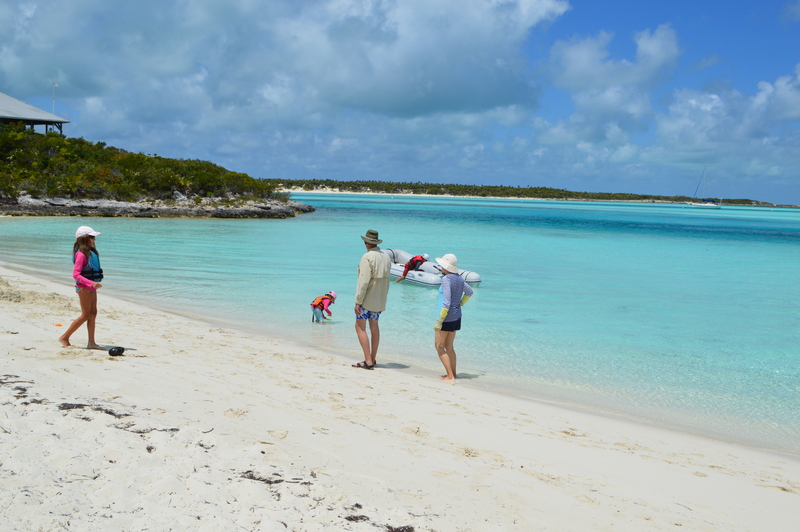 So our boat was in Staniel Cay but my parents flew into Black Point. 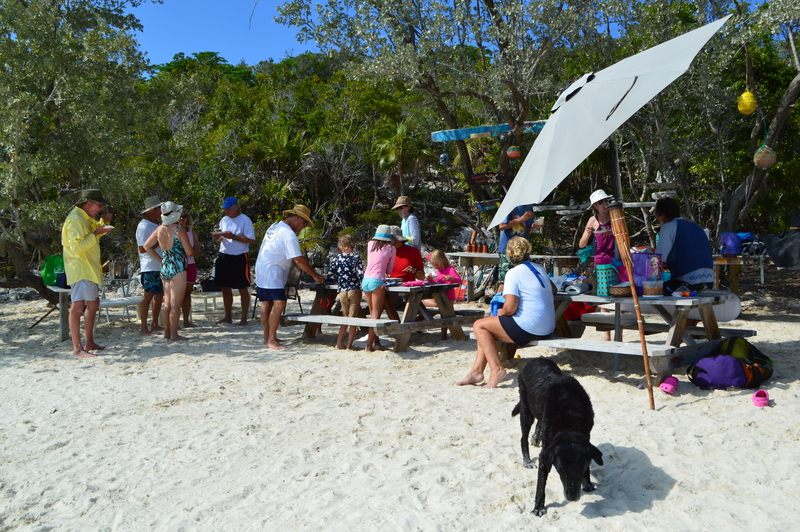 Luckily the airline took all the passengers from Black Point to Staniel Cay on a fast boat. My golly this was quite an adventure already for my parents (AKA Mimi and Jaybird to the kids). As soon as my parents arrived, we all dinghyed to the boat and immediately set sail for Warderick Wells, a four hour sail north. Oh, have I mentioned my dad gets extremely seasick? He already had on his scopolamine ear patch, but it made him a bit loopy and he said he had a hard time putting one foot in front of the other. My dad was a trooper and although the ear patch made him feel like he’d had one too many rum drinks, he did not get seasick. 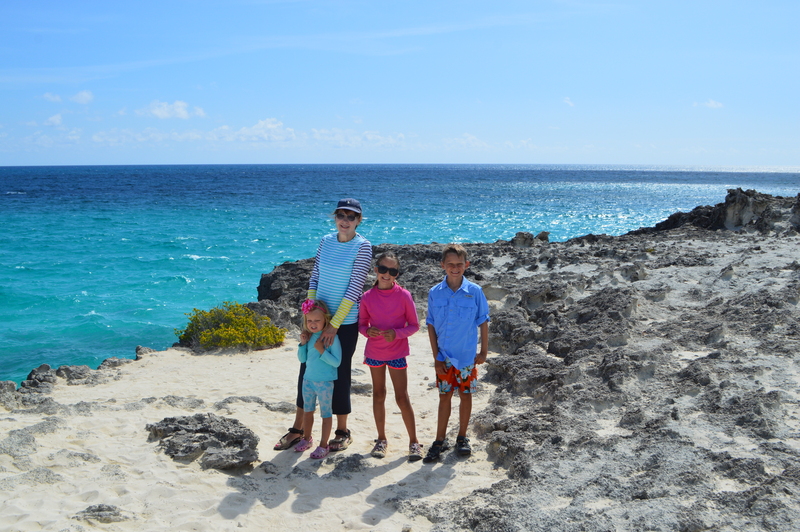 In my opinion, Warderick Wells is the most beautiful place in the Bahamas and we really wanted to take my parents there. It did not disappoint. The tradition at Warderick Wells is to paint a piece of driftwood with your boat name on it and place it at the top of Boo Boo Hill. The kids and Mimi and Jaybird had a great time and Boo Boo Hill ended up being my dad’s favorite part of the trip. 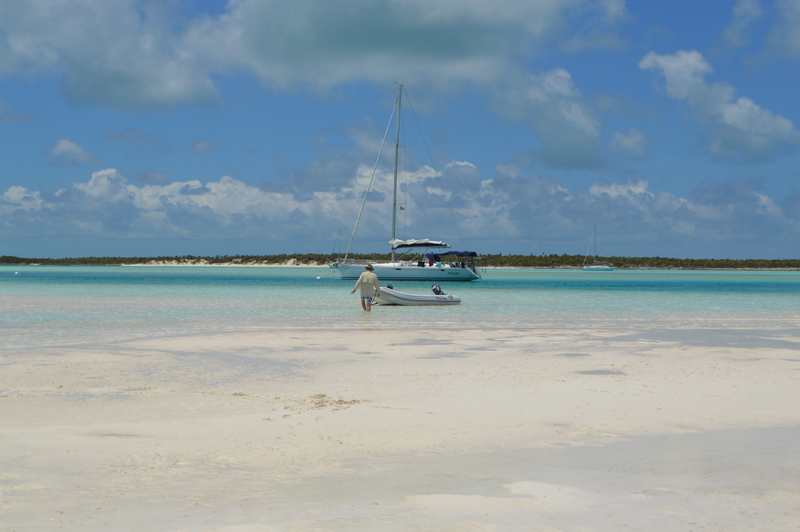 After two days at Warderick Wells we sailed back south to Staniel Cay. My parents really loved the island and all it’s beauty. We even snorkeled in Thunderball Grotto which is only accessible at low tide. The grotto is really like a cave. Have I mentioned my mom is claustrophobic? My parents were adventurous the whole week, definitely going outside their comfort zones at times. 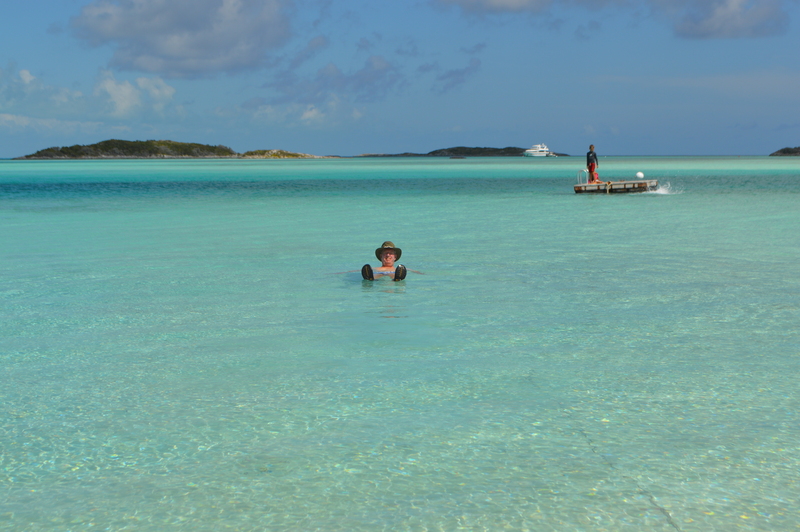 Later in the week we took a day to explore some of the islands near Staniel Cay. Unfortunately it rained all day. 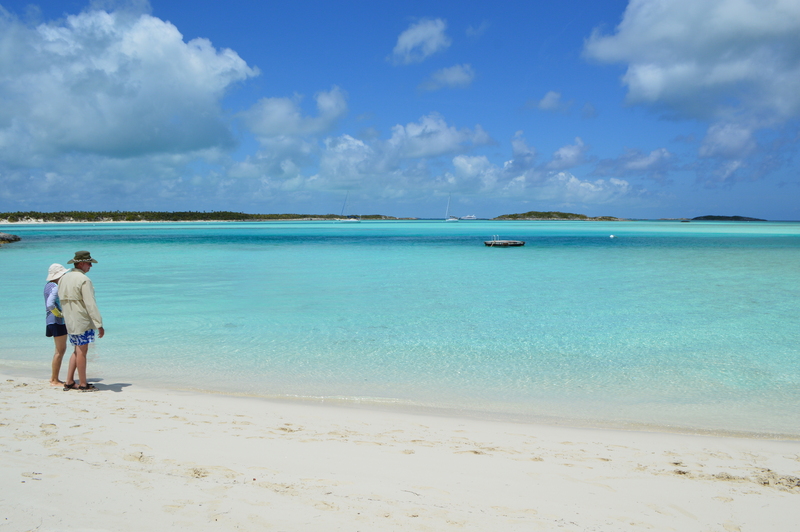 But we still got to go by Johnny Depp’s private island, Little Halls Pond Cay. Johnny was not out on his beach but I’m sure if he was, he would have invited us to come over for cocktails. Maria was hilarious and kept calling out “Johnny” in her little high pitched voice. But we did make it to Rachel’s Bubble Bath which was top on Maria’s list for her birthday week. It’s a spot where at high tide the water rushes over rocks and creates a bubbling whirlpool. On the walk to Rachel’s Bubble Bath we found all sorts of fun sea creatures. The kids got to skip out on homeschool last week with my parents here, but I’d say they got their fill of science! and 2) a Bahamian straw purse from Bob and Stephanie made by the local ladies in Black Point. The birthday party was loads of fun. My parents got to chat with a lot of cruisers, the kids ate tons of cake, and I was granted my one birthday wish, to be with my parents on my birthday. You can’t ask for more than that. Update: We are currently on the SE corner of New Providence Island. Today we will sail for four hours to the west side of the island and anchor overnight. Saturday at 6:00 am we will set off and sail 18 hours straight across the Bahama Banks toward Bimini. We won’t be able to make it all the way to Bimini Saturday so we will drop the hook and anchor for a few hours on the banks to get some sleep. Then Sunday morning we will sail a few hours and reach Bimini before unfavorable weather sets in Sunday evening. From the looks of it, we will be in Bimini for quite a few days waiting for good weather to cross the Gulf Stream back to the US. So glad your parents made it for your birthday. I’m also one of your biggest blog fans and love reading your journals and passing them along to Kim Zornes who also loves to live your experiences through you. Pat, thanks so much. You are so sweet. Yes, we’d love to see you as well. We will be back early June – June 14. Hope you are well. Happy belated birthday to both of you….always love the posts and the pics! Can’t wait to see you soon! Thanks Jay. Looking forward to seeing you too! What fabulous birthdays for the 4s!!! We are so happy for all of you on this wonderful journey & thankful that you are including the rest of us with postings & pictures! Safe trip on the next leg – as always, you are in our prayers. Happy Belated Birthdays!!! Beautiful!! Happy big 4-0 to you and happy big 4 to Maria! Love the memories you all are creating! Safe travels back! What a fantastic birthday!! I love reading your blog and seeing your beautiful pictures! So glad that your parents were able to spend this special day with you. I hope we can spend time together when you get back! Rock on, Jaybird & Mimi, and happy birthdays to Maria & Jen! 4-0 and 4th birthdays to you ladies! I’m so gld they were able to make and to you Jen, what a blessing! The pictures, as always, are breathtaking! Safe travels on the next leg of your journey! What a wonderful birthday!! One, I’m sure you won’t ever forget!! Kuddos to your parents!! I know that with all of my insecurities with small planes and being claustrophobic, it would have been a real challenge for me. Safe travels back to the US, and hoping to see you all when you get home. Sheri, I kept thinking of you when my mom told me how small their plane was. My parents were in the front row and the pilot was just feet in front of them. No separate pilot room. And the pilot got a little bored so started playing an empty water bottle with a pencil. My mom was thinking, “Shouldn’t you be paying more attention?” Ha! My mom was such a trooper! And yes, we really want to see you when we are in Indy in June. Thanks Sharon for your sweet words. Having great parents is such a gift that not everyone is lucky enough to have. You and I are some of the lucky ones. Wonderful to hear from you. Nothing better then Family love. Can’t wait to see all of you when you return.